Planet Rump is keeping things funky-fresh by focusing on writing and recording their next album and taking a break from performing live. But worry not! DJ Tantric and Miss Strawberry are continuing to rock the party via frequent DJ sets, and Nasty Ness is keepin it extra funky in the Caribbean! Get ready for the re-emergence of Planet Rump’s live set this spring with brand new songs and super-charged live performance energy! Until then, don’t stop dancing! 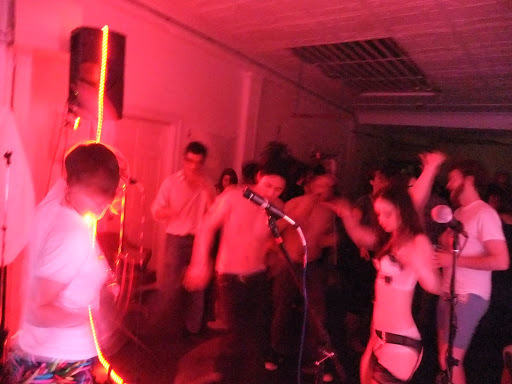 Check out the video clip of Planet Rump’s DJ set at Glasslands and some photos from other recent get-downs, and definitely come let loose at the Golden Arrows album party on Thursday March 3 at Canal Room! DJ Tantric and Miss Strawberry rockin the house at Glasslands. Miss Strawberry dancing & party-rockin at the Pants Off/Dance Off at a Bushwick loft. 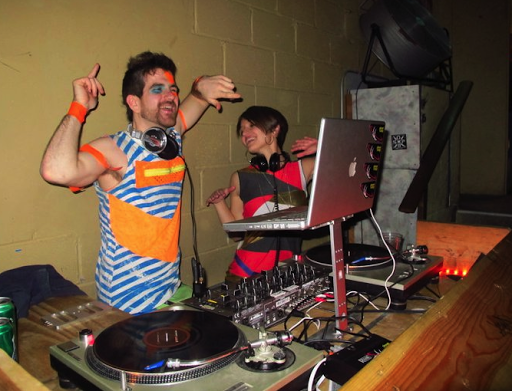 In case you’re dying to know where DJ Tantric and Miss Strawberry find their funky threads, they are handmade one-of-a-kind originals by Brooklyn designer Jillian Lanier. Check out more custom pieces here.